Although migrating library applications to Cloud environment is not an easy task, many libraries are interested in using Cloud infrastructure services broadly across their businesses. Whether it is about a Public, Private or Hybrid Cloud, they are expecting better scalability, redundancy, availability and elasticity, or ubiquitous access to digital preservation environment. In real-life setups, digital preservation environments are complex systems comprising multiple software components (e.g. Apache Hadoop, Taverna workflows and a plethora of tools for characterisation, migration or QA) that need to seamlessly work together. All these components need to be consistently deployed on all the nodes of the infrastructure. When these nodes are a mix of physical machines, virtual machine on private cloud and virtual machines provisioned from public clouds, the task of installation and configuration of required software packages on the nodes becomes a complex, tedious and error-prone one. This is where Cloud Deployment Toolkit comes in! It makes your life easier allowing you to easily deploy and monitor your tools on a hybrid infrastructure. 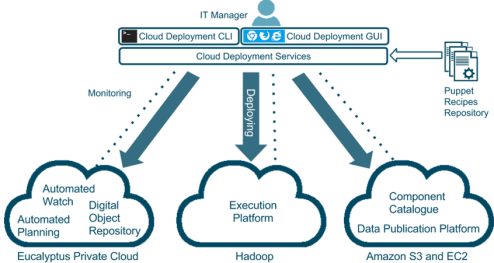 What is Cloud Deployment Toolkit? Libcloud – for interfacing with multi-vendor Cloud services. Enables easy extension for new packages.